While we were doing our field work on the Key West City Cemetery, we visited the East Martello Museum, home of the famous Robert the Haunted Doll. 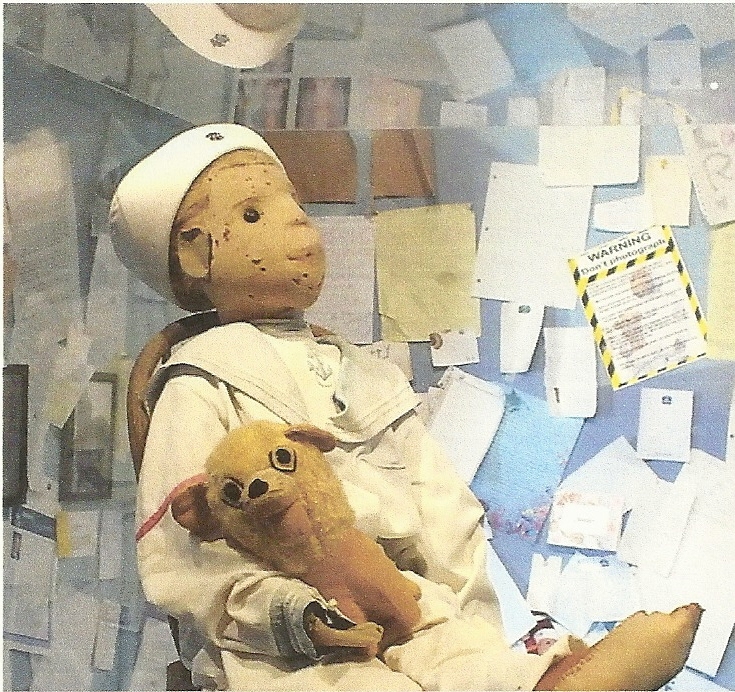 As it turns out, it is one of the best known haunted doll stories for those interested in the paranormal. One reason for Robert’s fame is the rather large number of people who claim to have witnessed the evil doll at work or have actually been victimized by him. Here’s the story? 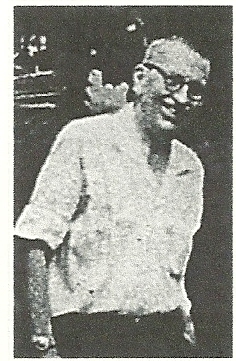 Robert Eugene “Gene” Otto was born in Key West in 1900. His wealthy parents were strict disciplinarians who abused the household staff. Gene’s favorite servant was a Bahamian woman who got on the wrong side of his mother. Mrs. Otto fired the lady. 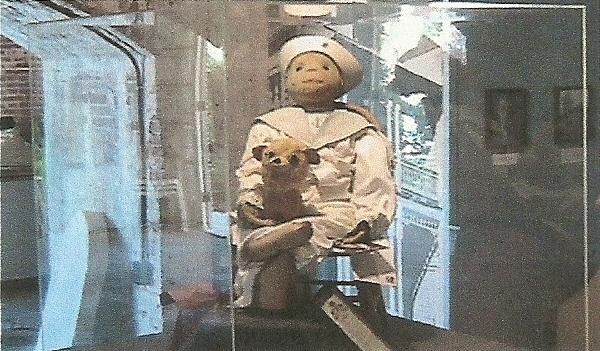 But before she left, the servant who was skilled in voodoo and black magic gave Gene a three-foot tall, handmade, stuffed doll that bore a resemblance to Gene dressed in a sailor suit holding a small dog. Despite their strange relationship Gene took Robert everywhere he went. At dinner Robert had his own chair at the family table. He would watch Gene bathe. The boy would tuck Robert in bed with him at night. As time went on these paranormal events became more disturbing. Silverware would be found thrown around the dining room and kitchen, servants would be locked in a room while cleaning and some of Gene’s favorite toys would be found mutilated. Neighbors reported seeing Robert in the attic window rocking in a chair and yelling threats at them. Gene eventually married. Needless to say, the marriage did not go well. 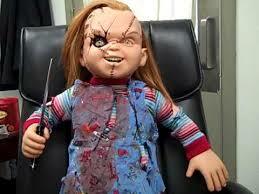 He insisted that the doll still dine with them and sit at night in a chair beside their bed. And Robert accompanied the couple everywhere they went including vacations. This odd behavior resulted in a failed marriage. His wife ended up in an insane asylum where she died. Otto died in 1972. For a while Robert had the house to himself and was reported to continue harassing passer byes. A couple purchased the Otto home and for unknown reasons stored Robert in the attic where he continued to wreak havoc. He terrified their daughter and the parents said once they woke to find Robert at the foot of their bed holding a butcher knife. It was this act that was responsible for using Robert as the inspiration for “Chucky,” the notorious serial killer doll in the 1988 horror movie Child’s Play. The new owners put the house on the market and moved out immediately. Robert found a new home in the East Martello Museum on the island where he is on display in a glass case. However, it seems that he is not too happy in his current environment. Visitors to the museum report Robert at times smiles and in the next minute he is raging mad. Others say unless you ask his permission it is impossible to take his photograph. Only a blurry or blackened image will appear. Still more say they feel Robert put a curse on them. There are YouTube videos about Robert. But you might want to ask his permission before you watch!